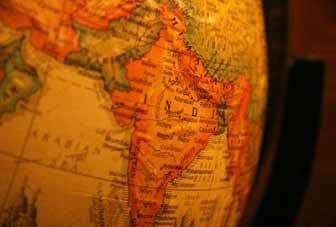 Indian Companies: Moving Towards Multi-national or Global Cultures? | Business Article | MBA Skool-Study.Learn.Share. Indian Companies: Moving Towards Multi-national or Global Cultures? The Article written by Akash Agarwal from IIM Ahmedabad is the Second Prize winner of the July 2012 Article Writing Contest. The article tries to delve into how Indian companies are establishing their cultural identities in this high-growth scenario characterized by Indian companies leaving their footprints abroad and competing with international companies on the domestic front. According to me these four layers are very dynamic where a company at a lower level always aspires to reach at a higher level. 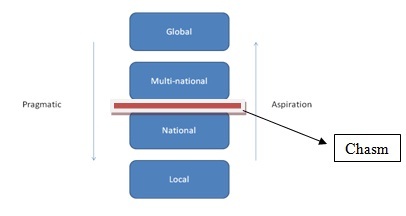 However, once at a higher level it needs to be pragmatic enough to realize that it cannot operate at that level alone and adapts and adjusts according to the local cultures. A company like Mc Donald’s has preserved its ‘global’ image by working at the ‘national’ level in different surroundings. As an example, they serve food like ‘Mc Aloo tikki’, etc. according to the Indian taste. Similarly, a company like Google also has come out with customized homepages for various countries. The theme that stands out among these is that though they have standard symbols and artifacts to globalize their brands, the service or products might vary from country to country to serve the local needs. he consultants get paid handsomely and the Indian companies project themselves as companies following the multi-national approach. However, in reality the reports and presentation lie untouched for several months and years. The reasons cited for the same is also the discord between upper layers of management and middle layers. At the same time, talking to my friends coming from private sector companies like Airtel and Flipkart, I found out that such reports were very effective in giving their organization a new direction and working style more akin to a multi-national approach. Thus, it is important for the higher management to get the entire team/organization onboard before starting on this sojourn. Adoption Many companies try to adopt international working styles. This practice is often observed at manufacturing organizations where they label their companies on Japanese standards. The degree of effectiveness varies from company to company. At NTPC, I observed that Japanese fundamentals like 5S, Lean Management, etc were all implemented on paper only. On interacting with my seniors, it was seen that the lack of trained individuals and support from higher management meant that it lead to improper and ineffective implementation. On seeing the same implementation at Tata Motors, it was observed that a thorough training procedure was adopted before going in for implementation. This meant that all employees were aware of both usage and benefits of such procedures. Chasing Several companies try to ape the multi-national culture followed by American firms in the hope of reaching the ‘multi-national’ level. This is seen at several BPO’s in India where people are made to work at odd hours which are justified by the firms as following the American model. After talking with some friends in BPOs in Delhi region, I realized that Indian companies flounder when they try to establish standardization across all verticals and businesses. In this context, even if BPOs are following an ‘American’ culture, it is important to keep the local and national settings in context. For eg- In Delhi, it is essential to realize that employees especially ladies should not get working hours which end at 12 in the night. This approach is also seen in several Indian brands like Peter England, John Players which portray themselves as Western brands. They do this not just by naming themselves as their western counterparts but also through their advertisements and models which show foreign people. The Indian consumers always look towards the West and such brands can easily strike a chord with the consumers. On a random survey of 10 people, I found that 9/10 people responded by saying that Peter England and John Players were western brands. This phenomenon has further added fuel to this speculation that simply copying an ‘American’ style would be enough. Denial There is also a separate wing in India which believes that is strictly against foreign content. This wing refuses to change its image and is perennially stuck at the ‘National’ level. This is often observed in government organizations. In order to protect their ‘Indianness’, they are stuck with their age-old style of working which is anything but progressive. On being interviewed, there was an observation that with Mrs. Sonia Gandhi, an Italian, at the helm of the Indian political map any move to change could be seen as transgressive by the public and other political parties. This is also seen when an International MNC faces problems when entering India. The recent case of IKEA is an example. All of the above need to be addressed keeping in mind the Social, Technological, Political, Economic and Legal frameworks established in different regions and countries. They also need to realize that even though one has become a Global company, it is important to be practical and apply the local flavor where it is needed. Based on the above examples, it is essential for the companies to realize that the change has to be top-driven but unless the whole organization believes in it, it would not work. Indigo Airlines: The only profit-making domestic airline in India, Indigo has clearly been able to cross the chasm and work at a ‘Multi-national’ level. India has always been associated with the ‘Indian Standard Time’. Especially for transportation services, trains or airplanes arriving 15 minutes late is a common scene. In such a setting, Indigo has established an on-time performance score of greater than 90%. Right from its operating strategy to its advertising strategy, the move to shed the Indian tag and portray itself as an International brand. Their recent promotional strategy also highlighted this where they show an international team flying their plane. Thus, it has used its multinational approach itself as a differentiating factor. Infosys: Infosys is a global leader in providing IT solutions. By getting itself listed on NASDAQ, it showed its intent of operating on an international scale. It is a classic case of a company which has traversed through the entire 4 stages of culture. Starting from a small Indian city, it now has offices in over 30 countries. It has regularly won international acclaim for its corporate governance policies. Again looking at their website, it can be seen as a conscious effort from their part to portray a global image with pictures of their international clients. They have a very diverse workforce which works across different geographic locations and cultures. Though they have standardized policies, every regional office has some local policies to suit the regional context. Flipkart: Flipkart is an upcoming online retail firm which has moved up on the Amazon model. It successfully beat the Indian image of late and poor deliveries. It also successfully changed the landscape of online shopping. It needs to be a highlighted that rather than simply imitating the Amazon model, they added tweaks for the Indian context. This helped them to beat early entrants like Indiatimes and Infibeam. On talking to interns from the firm, it was again seen that the whole firm believed in the promise of delivering a quality product on time. This fundamental belief has helped them stay as the market leader in the Indian industry. The various interviews and surveys with different people from different sectors and areas makes me believe that Indian firms are now becoming aware of this chasm and have started making some steps in that direction. The willingness to change is there, but the firms are often found wanting on the implementation front. However, companies like Indigo and Infosys have shown that with coordinated effort and willpower, companies can cross the chasm and become global names. This article has been authored by Akash Agarwal from IIM Ahmedabad.